Richard Louv speaks in his book, Last Child in the Woods, of children taking ownership of a special place in nature. When our All Seasons Preschool staff heard Louv speak in February, he encouraged the audience to recall their own special child hood place. My own place was a “fort” I constructed in a space wedged between the wall of our rusty aluminum shed and some old railroad ties. I created a roof from plywood I “found” (in our next-door neighbors’ lumber pile) and procured tree branches and other items from nature to create the walls, furniture, and even a working door to my small enclosure. I recall this place of my own construction with great fondness. I did not share it with my cousins or brother as I did our tree houses, our yards, or swing set. In fact, much effort was taken to ensure they did NOT spend time in my special place- I believe a “No Boys Allowed Sign” was even erected. I worked hard over time to complete it to my liking, and no one helped me with any part of it. These memories got me thinking about how many children today are not allowed this same sense of a place over which they can claim complete ownership- not in their bedroom, not in a temporary fort made from pillows under the coffee table, but outdoors. 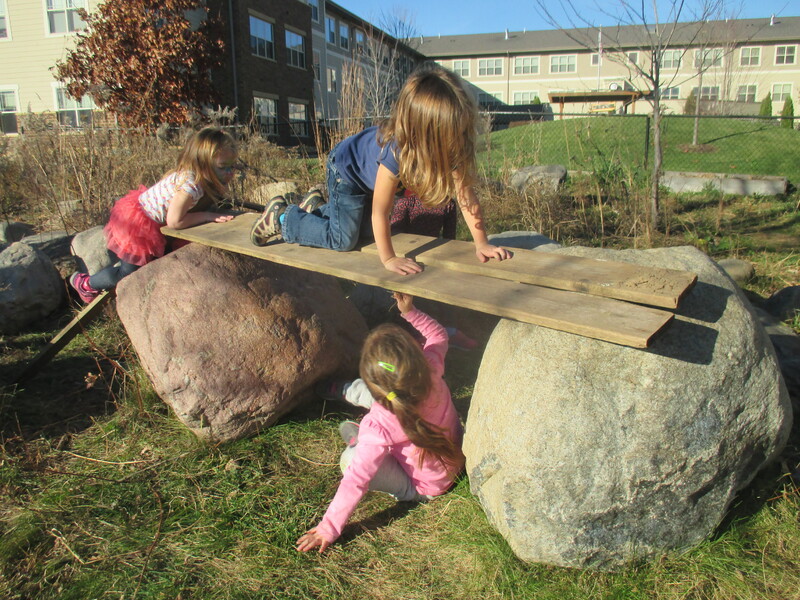 Today’s children are rarely allowed to experience any outdoor time completely alone or the opportunity to create, build, and alter their environment. 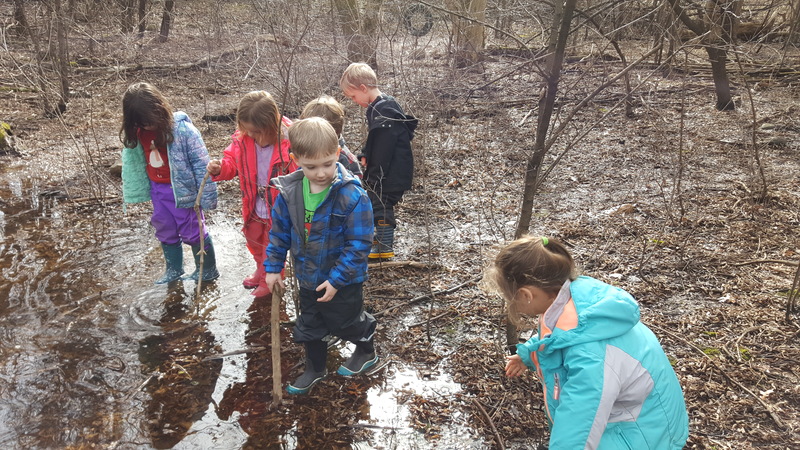 The outdoors has so much to offer children to teach building, experimenting, problem solving, and creating a special place in which to take ownership. These, of course, are just a few of the benefits children can reap from spending time in nature. 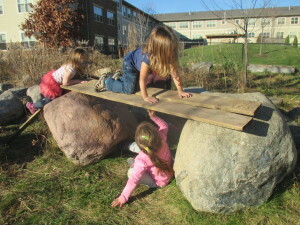 While times and outdoor spaces have changed, children’s need for a place to call their own has not. The need to manipulate one’s environment and to create a special little spot remains. This sense of place is something we foster at All Seasons. Our students are not exactly stealing 2×4’s or erecting tree houses with rusty rails, but they are allowed more freedoms than in other settings. As we get to know our students, teachers can increasingly trust our children to venture further from adults. Teachers have the rule that children need to be within sight or sound of a teacher and you must be able to hear a teacher when they call you. 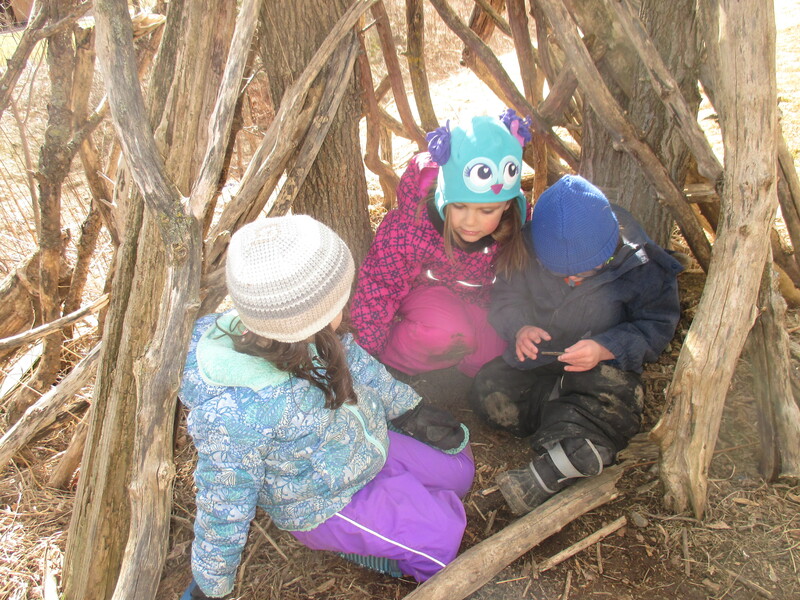 Here, children can play with loose parts, including stumps, boards, sticks, and logs. Classes return to the same play spaces repeatedly to become comfortable with the area and to try new activities according to the season, but also to allow the children a sense of ownership. Teachers want the message to be: These are YOUR woods. This meadow belongs to YOU. Find a spot where you can be- where you can experiment, move, create forts, enlarge a puddle, or simply sit and listen to the world. So much of the world is off limits to children. It can be vital to have control over a special place. This sense of ownership helps children develop logical and mathematical reasoning, impulse control, decision-making, imagination, and a sense of stewardship for the natural world. All Seasons is a place that can provide children their special place. Where was yours? Where can your child’s be? This February was 10.3 degrees warmer than normal in the Twin Cities, making it the 7th warmest February ever recorded in Minnesota. Our snowfall total squeaked in at .3 inches, tying the 1894 record for the lowest February snowfall. 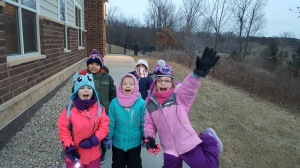 Winter in Minnesota is truly not what it used to be, and it has affected the implementation of our curriculum. This winter, we dealt with crippling ice and sloshy mud, sweaty gloved hands and soaked clothes; we wondered how to dress the children and ourselves amidst melting piles of snow and 60 degree temperatures. But above all, we wondered about our environment, and the place of our curriculum in a climate that is changing. Winter has always been a favorite – if not the favorite – season at All Seasons. While other schools tuck their students away as temperatures drop, we rush out, joyful and eager in the winter wonderland. Students and teachers alike look forward to sledding on the golf course, a weekly occurrence most years. We made it twice this year. Building a quinzhee, a snow shelter originally made by Athapaskan Indians, outside the Autumn Room door then constructing an ice slide through the middle made for hours of delight. This year, our meager pile lasted just a few days. It was rare to identify and follow animal tracks, and animal burrows in the snow were non-existent. Favorite winter books, such as The Snowy Day and Over and Under The Snow, didn’t carry the same weight without the connection of firsthand experience in snow. Even simple pleasures, like shoveling snow and leaving water out to freeze, were not possible. A few of the second or third year students remembered the things that we missed this winter, asking when we could visit the golf course or work on our quinzhee. Even our youngest students often asked, “Can we build a snowman?” at the sight of a snowflake. It was with disappointment that the teachers answered, “No, we can’t.” It was a difficult place to be, the funny place between seasons, too early for much of our spring curriculum but impossible to embrace our winter curriculum. One aspect of our spring curriculum, tree tapping, found its place in early February. Children helped drill into trees and marveled as sap began to flow. We had several days that met the criteria for good sap collection – above freezing during the day and below freezing at night. Then the temperature pendulum swung in extremes, with some days being too cold for the sap to flow and some nights being too warm. Thankfully, we were eventually able to collect a bounty, and we will continue to collect sap until buds form on the trees. One of our core tenets is to help children develop meaningful, respectful, and lasting relationships with the natural world. We teach our students to become stewards of the environment and marvel as they pick up trash they find outside and go out of their way not to step on an insect in their path. We want them to wonder, just as we wonder, why there isn’t snow, what season it really is, and what our place in it all is. As the wind whips outside and our days get longer, we wonder, too, what spring will bring. There is one thing we know for sure: We’ll be there, observing, experiencing, and surely filthy in the great outdoors. 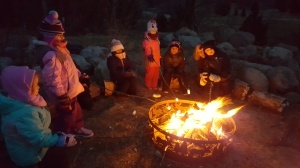 As families know well, nature education is part of our three-part mission at All Seasons, along with our intergenerational connection and art program. The evidence often comes home in the form of wet, muddy, or grass-stained outdoor gear, burs imbedded in clothing and hair, or the occasional wood tick that has escaped our daily examination. At least to our faces, parents are good sports about the messy children that get strapped into car seats at the end of the day. 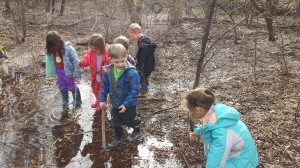 Growing research supports what we environmental educators have known for a long time, that children’s knowledge and all developmental domains are expanded and deepened by time in nature. So it’s probably no surprise that all of our major school parties are focused on time outdoors—the Fall Campout, Kid’s Night In, and our Earth Day celebration. A week of discussion preceded Kid’s Night In, along with books related to the activity—Owl Moon, South, Over and Under the Snow, Owl Babies. 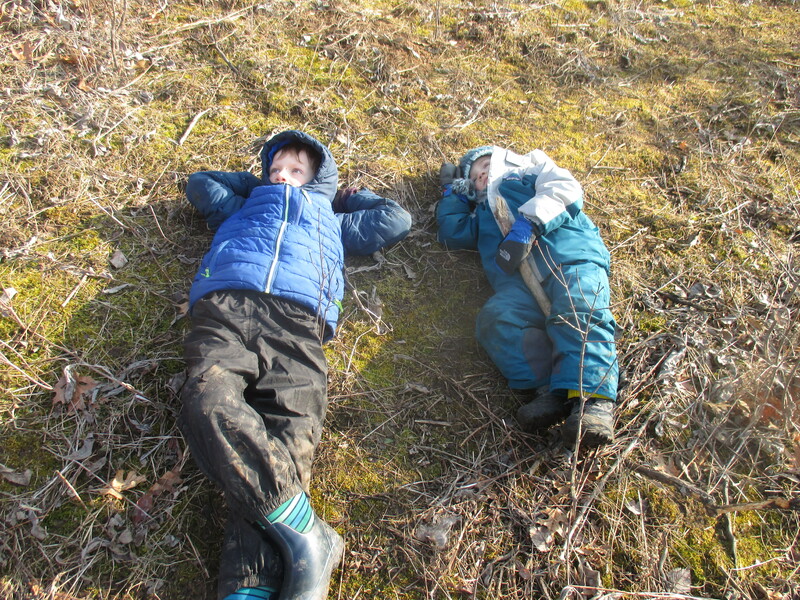 The day of the party, several owl pellets were found on a hike to The Swamp. (Owls swallow their prey whole and then cough up the indigestible fur and bones). A couple pellets were previously found in our own Pine Tree Forest, so we planned to check that out during our night hike, as quietly as we possibly could. Each teacher had a small group entrusted to her for the evening. In my group, I had several of the younger children, which affected our itinerary in interesting ways. We headed out to The Pines, and even though it was till dusk, this familiar play destination looked spooky in the semi-darkness. 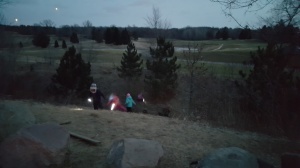 Added to the diminishing light (and no Mom or Dad) was the notion of being quiet so we could listen for owl sounds. I was wishing I had four hands for all those who needed them. “Do owls eat people?” “When can we go back to the school?” “Where are the other kids?” The older children were excited to remember where we had pitched our tents for the Fall Camp-out and actually slept there all night. We could see the lights of our building and even the light from the pop machine on the golf course tee, offering comfort. We looked for golf balls and checked inside the bluebird house. Hands gripped onto mine relaxed a little and even let go for a few seconds. The older children’s excitement at being outside in the dark seemed more comforting than my enthusiasm for the adventure. We stopped at The Boulders to roast marshmallows and rejoin our friends. Then the fun really started for my little group. Once we moved to the playground all was well, even though by then it was truly dark. A familiar space with no wildlife and all their friends set them free, and off they went to run and dance, roll down the hill, shining flashlights*—a wild gathering of winter fireflies. I actually had a moment of anxiety as I stood in their midst, about some headlong collisions in the darkness, but none materialized. Even children I expected to hunker down in one place out of the fray, were swept up in the swirling fun. So now they all have a memory of hiking in the dark at school, revisiting places that look very different in the night. They have images of firelight, the taste of marshmallows, the pleasure of reuniting with classmates whose voices they had heard somewhere out in the darkness, the power of making their own light and fun on the playground. And somewhere in there will be a memory of having been safe—and brave—in the wild dark. *We had extra flashlights for those who hadn’t brought one.